I have just finished rebuilding my 1954 Chevy Belair, 235 ci engine. I bored .030 over, everything new except the crank. I'm breaking in now, I'm at about 500 miles using a good 30w, high zinc and phosphorus break in oil. What do you great people recommend as a good oil to run after break in? I have read about these old engines needing high zinc, but not sure what weight...10w 40? 10w 30? stick with a straight 30w? It's been years since I've owned an old car, and I know oils have changed drastically. This car will be a weekend get away car for my wife and I, 300 to 400 mile trips, at 65 to 70 mph speeds. Want to get the most out of my rebuild!! Hi Mikeky, welcome. I would ask your engine builder who set all the clearances in the bearings and rings what they intended. Otherwise, I would go to the online manual for the factory recommendations. First off there is no such thing as 30W oil It will be just #30 as it is not tested for winter temperature. An engine should be broken-in with a light oil. When the 1954 was new Chevrolet used and recommended #10, today I would use 5W-20 as #10 is no longer available. Once broken -in 10W-30 will be a good choice. A 1954 straight 6 had fairly low cam to lifter pressure so no additives are necessary. There is enough zinc and moly in 10W-30 oil. 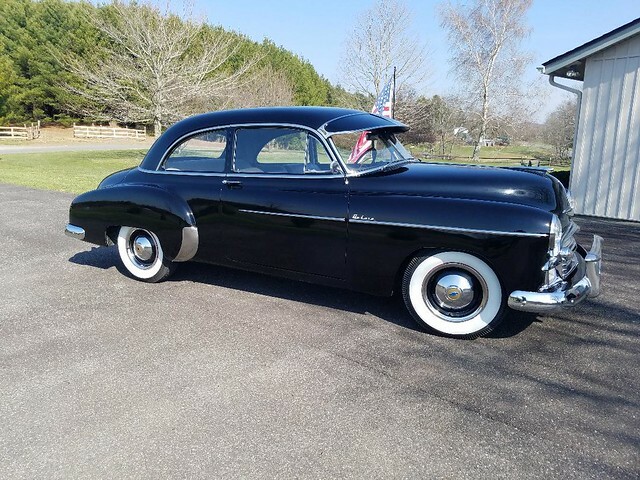 A 1954 will have a 3.70 rear end (3.54 if Power Glide) and 65-70 should be a comfortable speed after you get 2000 miles on it. That speed is OK now for shorter distances. When your'54 was new there was next to no zinc in the oil and they never wore out camshafts. Edited by Gene_Schneider on 09-13-18 07:30 PM. Reason for edit: No reason given. What about switching to mobil1 synthetic oil? My situation is a bit different, small block, ran typical 10w30 twice, actually rinsed motor out then switched to 10w30 mobil1 syn. No issues, just a thought. Thanks for the responses. The reason for inquiry, is oils have changed over the years, and just wanting to get opinions on today's oils. The 1954's did do well on those oils, but will they last longer on today's oils? Just thought I'd get a few opinions, other than ones the local classic car owners expressed. Never hurts to look at newer options for older classics!!! Thanks to all for your valued input. NO synthetics should ever be used in older soft metals engines. I would use the oil I was going to run it for its entire life, not lower viscosity to break it in. 30 wight oil would be fine, and if you had to have a multi-viscosity oil for winter use, no lighter than 20W-50. I live in a climate that changes from minus 10/F to 112/F this year, and no problems doing it that way on my older engines. Please be aware, our older engines do not have modern low drag, low friction engine parts, so, the lighter oils designed for those low friction engines, especially a partial, or full synthetic that is fine in that later engine, just don't work well in our earlier engines. I would break the engine in on the oil suggested by the rebuilder if for no other reason than the possibility of a come back. After wards nothing but Castrol 10/30. Hi Guys, I am with Ignition man here. Do not try and run in an old engine on Synthetic oil. Also don't use a high detergent oil either. Oil is oil is oil. It doesn't lose its lubricity over time. What happens is it gets contaminated, and the additives get used up. Synthetic oil is not made from flowers, its still oil, just processed more. During the run-in process, the important requirements on older style engines and parts was a controlled wear process called bedding in. Primarily this is about the rings bedding properly. If you let them idle without load two big things go wrong. The rings polish against the bore and don't make a seal surface and there isn't sufficient splash lube on the cam lobes and they fail. Some modern oil additives act against old school break-in. Procedure is as important as oil here. In modern engines, the rings usually have a special bedding coating on them and self-seal quickly, plus the cam lobes have a surface treatment for the same reason. Lubrication is also often far more effective and clearances are set based on modern oil performance. Your reconditioner should tell you what oil to use once run in. It depends on the conditions and how they set up the clearances. Edited by Bel Air kiwi on 09-17-18 06:07 PM. Reason for edit: No reason given. Some of you may recall that after my little bottom end knock a couple of years ago, we tore the '55 235 down and rebuilt it with a '62 "848" head and '62 crank. We used a conventional 10W30 (I think Quaker State or Havoline)along with a zinc/ phosphorus break-in additive for a while. I then changed back to the Valvoline VR1 which I was using for years before my knock developed. Here's my question: I've been hearing about people using Rotella T4 diesel oil in the older engines successfully to get more ZDDP. I also heard that the Valvoline VR1 may not be the best choice because of the low amount of detergents and anti corrosive agents. What do you folks think? Thanks in advance. Rotella T4 10w-30 was recommended to me after I bought my car, and that's what I use. Thanks Dave. Where do you get yours? I was told that Walmart had it but after checking with three different stores, all I saw on their shelf was 10W30 synthetic (gray jug) and 15W40 conventional (white jug) for $12.97/ gallon. My local NAPA had a one gallon jug (only 1) of the conventional T4 10W30 for $19.99. I get mine at Advance Auto parts. Our Walmart doesn't carry the 10w-30 T4, either. "just wanting to get opinions on today's oils"
You know the old saying about opinions and hemorrhoids don't you? Why not call one of the many oil companies and ask them for a recommendation to match your situation? I've had great luck doing that. Most recently I was looking for a true SAE 160 gear oil for my '36 Chevy PU transmission. A lubrication engineer at Lubriplate gave me an exact product number that matches that SAE designation and is available in small quantities (quarts). Now that '36 that I've owned since 1965 shifts way better than it ever has with any of the gear oils available from auto parts stores or the so called "600W" oil sold by the antique auto parts vendors. Those oil company lubrication engineers are really experts in their fields. I've actually had them offer to send me "samples" as large as a case of synthetic chassis grease cartridges and a grease for the Vega steering box in my '32 Ford roadster street rod. Hi Mikey, the thing with a 54 or any of our engines up to about 58 is that their oil filter, if they have one at all, is only a bypass filter. So unlike the later stuff where all the oil going into the engine is filtered each time it passes. On the earlies only the oil that is bypassed (Not used in the engine but been through the pump.) is filtered on its way back to the sump. Oil change intervals are far more important than fancy expensive brands, and they are much shorter than modern cars. So in truth the cheapest genuine oil in the correct weight is all you need as you will be throwing it away about five times more often than some modern cars. You should check the online manual but some earlies were a grease and oil every 1000 in dirty areas of operation. Thanks Kiwi for your input on this. I have been conflicted about this for a while now since the opinions vary widely.The page for Valvoline VR1 questions actually made some statements that confused me with regard to the VR1 Racing oil. That was the oil of choice (straight 30) as it was readily available and was heralded by most I spoke with as having the proper amount of ZDDP so that's what I used. Here's the information right from Valvoline's page that made me rethink this: " What is the controversy surrounding the amount of zinc in motor oil? The controversy exists as a result of many hands-on car enthusiasts and engine experts belief that lower levels of zinc in API SN and SM motor oils can cause excessive wear in older style push-rod and flat-tappet engines. They hold this belief despite the fact that all new motor oil classifications are intended to be backward compatible. " It also indicated that the racing oils contained less detergents than conventional oils and that zinc levels higher than what they should be can actually be corrosive so additional zinc additives were not recommended. I started thinking about the backwards compatibility and wondered about what Gene had said about a good 10W30. Maybe I've been overthinking this all along. After all, I tend to want to overbuild everything I get involved in. During any given year, I'll put 2000 - 3000 miles on the FortyNiner. Most of that happens between April and October. They tell me that the oil we use today is better in so many ways than what these engines had running through them back in the day so like I said, I'm rethinking this whole thing and I'm real close to ditching the VR1. Most issues arise as a result of older style agressive ramp flat tappet cams with high spring pressures, not properly broken in, these engines may experience cam failures, but it seems for a variety of reasons this problem has all but evaporated. Some of my club cars are using VR1, I am using Valvoline 10/40 high mileage, moderate cam, with 110# valve seat pressures, sbc, 10k miles, no issues.